An estimated 322 million illnesses, 21 million hospitalizations and 732,000 deaths will be prevented thanks to routine childhood vaccinations, according to new statistics released by the Centers for Disease Control and Prevention Thursday. The agency said the nation's childhood vaccine program has been “highly effective,” although some vulnerability to vaccine-preventable diseases persists because of the rise in global travel and trade, and the small but significant number of Americans who opt out of vaccinations. After accounting for the costs associated with giving immunizations, the CDC estimated a net savings of $295 billion in direct costs and $1.38 trillion in societal costs from averting vaccine-preventable illnesses, hospitalizations and deaths. “This is an enormous impact,” said CDC Director, Dr. Tom Frieden, regarding the federal Vaccines for Children program, which has provided free vaccines to uninsured and underinsured U.S. children for the past 20 years. About half of all American children under age 18 qualify for the free vaccinations, according to Frieden, who called the program one of the nation’s most effective public-health interventions. 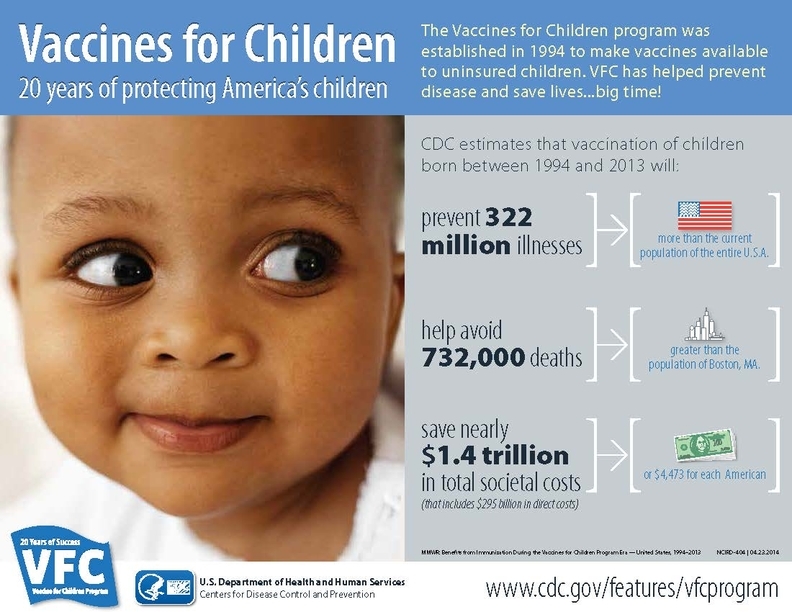 Using a model based on the 78.6 million children born between the program’s launch in 1994 and 2013, the CDC estimated the benefits of vaccinating children against diphtheria, tetanus, pertussis, haemophilus influenzae type b, polio, measles, mumps, rubella, congenital rubella syndrome, hepatitis B, varicella, pneumococcal-related diseases and rotavirus. Vaccine-preventable diseases, however, have not been eliminated in the U.S. Public health officials remain on alert in the wake of new reports of measles, mumps and pertussis outbreaks, and the small but continued presence of diseases such as chicken pox and rotavirus. In fact, another CDC report published Thursday found that, as of April 18, 129 people from 13 states have been reported to have measles. Health officials say the outbreaks include 58 cases in California, 24 in New York, and 13 in Washington State. “This is the highest number of cases reported within the first four months of the year since 1996,” Dr. Anne Schuchat, director of the CDC’s National Center for Immunization and Respiratory Diseases, said during a news conference. Physicians and other clinicians should be aware of measles symptoms and act swiftly to isolate infected patients, she said, because the disease can spread quickly in healthcare settings, especially to infants—children are typically vaccinated for measles at age 1.
International travel is linked to many of the new measles cases. Thirty-four of the 129 measles cases reported in the U.S. involved Americans who traveled abroad or visitors from other countries. Many cases were related to travel to the Philippines, where there is currently a large measles outbreak. Individuals who oppose receiving vaccinations are also increasingly problematic. Most of the measles cases reported this year involved patients who were not vaccinated, or did not know their vaccination status. Of those who were not vaccinated, 67% opted out due to personal beliefs. “Borders can't stop measles, but vaccinations can," Frieden said. Every state requires children to be immunized by the time they enter school, but 18 states currently allow exemptions based on philosophical, personal or other beliefs, according to the National Vaccine Information Center, which provides an interactive map illustrating the laws in each state. Except for California, Mississippi and West Virginia, all other states allow religious exemptions. The number of parents choosing not to have their children vaccinated remains low, however, with less than 1% of toddlers receiving no vaccines at all, according to Schuchat. The infrequency of vaccine-preventable diseases in the U.S. can be attributed to high-immunization rates and the rapid response of state health departments, she said, and she encouraged physicians not to let success lead to complacency. Despite celebrity and other anti-vaccine campaigns, “the most important influence on a parents’ decision is their clinician,” Schuchat said.